If you’re a small business owner with little experience in photography but love to learn, this post is for you. Last October, as my uber talented friend Edyta was photographing my holiday product collection, I snapped a few pictures. I love seeing “behind the scenes” pictures! They are very educational (believe it or not)! 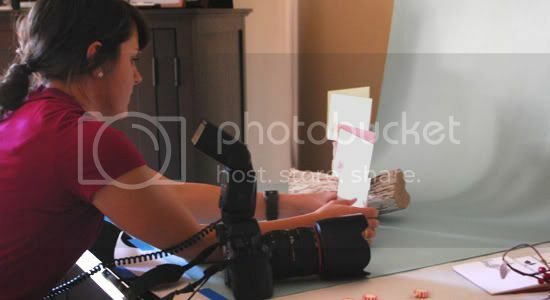 Picture : Edyta working her magic in styling some of our holiday stationery. So you got a fancy SLR camera. Now what? I bet most of the time you shoot on Auto setting. Been there – done that!! There is so much to learn and a lot of resources out there. I have learned a few tips from one of the best. The tips along with the logic behind them often help educate me when I’m about to shoot my products as well as when taking pictures in general. Let me tell you, it makes a huge difference. Knowing your camera settings is the most important part. But let’s not forget the significance of props in photography. Not only do they enliven a photograph but they help tell a story. That being said, props should never distract or draw attention away from the product being photographed. – what’s its function? does it tell a story? does it address a problem? – are the colors of the prop working with your product or clashing? Remember, the reason behind a prop is to enhance, enliven the quality of the product not obscure it. – try to show your product in action – these will inspire the customers picture themselves using it. – props can also help explain the process your product was born from. For example, the pictures below speak of holiday designs that were inspired by Christmas ornaments and other elements such as branches and natural objects. 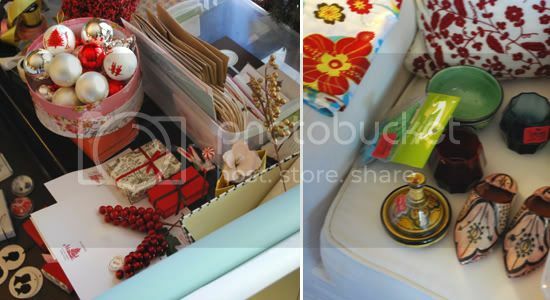 Picture : Various nicknacks we used on our holiday collection photo shoot. Picture : Edyta styling one of our wall calendars. Where do you find good props? They’re all around you – it’s just a matter of putting the right ones together to tell a story. Don’t forget to keep it simple. 1. light – how do the props look in the lighting situation you are shooting in? If you have reflective materials, keeping mind that your flash will bounce and your reflection will appear. natural, diffused light is your best friend, use it! 2. styling – establish a style or theme for the photo shoot. Edit your props based on how essencial they are to the product – do they relate? Less is more so make sure you’re not just filling the space but you have visual stimulants. 3. in-camera perfection – pay attention to every single detail in your view finder. angles, dust, cropping (how close or far away from object), reflections, dirt, negative space (space in between objects). the more you pay attention to this before you take the shot, the less you have to do in your editing software. – when searching for props, take a look at your local thrift store. You will be surprised at what you will find, for only a few dollars. – look for great styling examples on your favorite magazines. Take a moment to study/understand what draws your attention – trust your eye. Make notes of various techniques they use. – throw in the mix a few other products from your collection – this will help achieve two things: show their relationship as well as give a sneak peek to the rest of your collection. – lastly and most important, have fun with it! To view the results of our 2009 holiday collection, click here. I hope you found this post useful. If you have any questions and/or suggestions, be sure to list them on the comments area below. The post Tips on photographing your wares… appeared first on Le Papier Blog.